Bangalore’s appetite for water is beyond what can be supplied and is growing at an alarming rate. With a steady water supply a pipe dream, here's how the poorer sections of the city have managed to adapt to the crisis. Over the past few decades, Bangalore has earned the tag of a cosmopolitan city encompassing migrants from all regions of India and foreign diaspora. With a population close to 11 million, the city has witnessed a large influx of migrants during the years following the IT boom. Informal settlements mushroomed throughout the city, mostly comprising the migrant poor. Municipal planning has obviously failed to accommodate a rapidly growing city, as evinced by its flailing water infrastructure. As the city proceeds to grow in an amoeba-like fashion, the Bangalore Water Supply and Sewerage Board (BWSSB), which stewards the metropolitan’s water supply, is struggling to meet with the growing demand. The total installed capacity currently stands at 959 MLD, with the river Cauvery accounting for almost 90% of it. However, the BWSSB is only able to supply 810 MLD, almost all of which accrues to the city’s core area. Even the oft-quoted daily per capita figure of 110 lpcd (litres per capita per day) for Bangalore is a gross overestimate if one takes into account the ‘unaccounted-for-water’ mainly in the form of leakages pegged to be as high as 48%. It is difficult to ascertain where this ‘unaccounted for water’ is diverted to. Indifferent official information would attribute it to losses during transportation. However, certain studies have found that tanker operators often collude with valve men employed by the official water utility to siphon off water. There are plans in place for an enhanced reach of Cauvery water supply in its fifth phase expansion, which is set to add a little more than 50% of existing capacity, but experts are doubtful about whether this would be enough to quench the city’s thirst. Further, there are ecological and political limits to extracting water from the river. There are also high energy costs involved in pumping and transporting water from the existing surface water supplies. If the city’s core is under-served, the city’s periphery remains the neglected step-child of the BWSSB supply network. This area, which has witnessed the maximum growth in population, depends heavily on groundwater extraction to meet its water consumption needs. The BWSSB supplies part of the groundwater consumed by the city through a network of 7,000 borewells, but how much the peripheral area benefits from it is in doubt. Most of the supply is done by the private sector through an opaque tanker economy. It may be true that the private sector is only responding to the demand for potable water, but to adopt a business-as-usual approach may not be viable in the long run. CGWB estimates that groundwater extraction is more than 100% in Bangalore, that is that water extractions exceed recharge of the aquifer. In such a scenario how ecologically sustainable is it to rely on groundwater extraction? There have been official moves to limit the wanton groundwater extraction in the form of a groundwater statute and promoting rainwater harvesting. However, this has had little effect on the ground. Bangalore’s appetite for water is beyond what can be supplied and is growing at an alarming rate. The supply-demand gap currently stands at 46 MLD and is set to grow to 84 MLD by 2030. The stage is set for a water crisis. While it is undeniable that inadequate supply of potable water affects all, it is the poor and marginalised who are the most affected in a situation of scarcity. Not only do they end up paying more to access potable water, but the fact that they have to deal with irregular public water supply in their neighbourhoods is also a source of conflict. 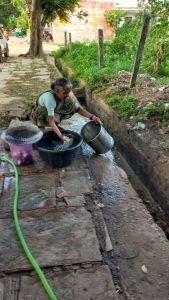 Lakshmamma (all names have been changed), a resident of Naganathpura, recounts that a few years ago, the irregular public water supply in her area would often lead to clashes with her neighbours who objected to her tenants accessing the scarce water supply from the public tap. This tap happened to be the only source of water in the neighbourhood. Lakshmamma has built a three-storied house in the neighbourhood where her family stays in a small part while the rest is rented out. The poor are often accused of being the major beneficiaries of public welfare services, but this isn’t so in reality. 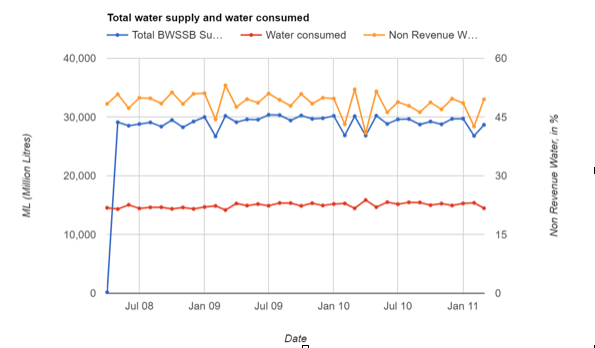 Rarely do water subsidies meant for the poor actually reach them as they are largely out of the BWSSB supply network. Moreover, such subsidies have mostly benefitted the non-poor sections, making the exercise of subsidisation redundant. 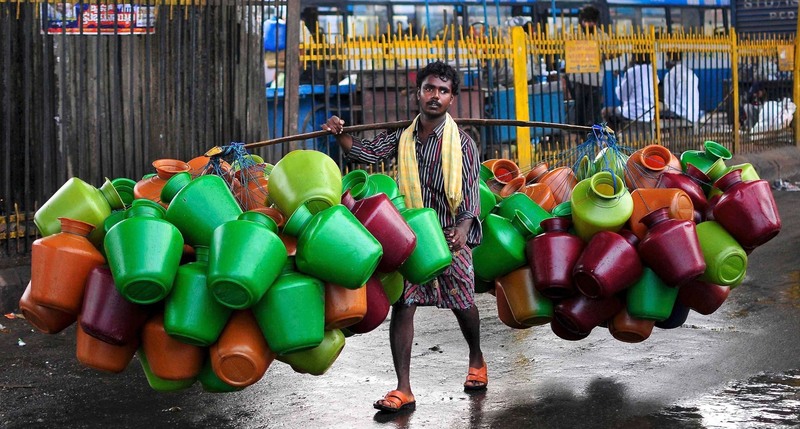 Further, only 23% of Bangalore’s public taps, mainly aimed at providing water for the poor, are located in slums, whereas the slum population in Bangalore is estimated to be 25 to 35% of the total population in the city. Such water provisioning is not only meagre but also shows the apathy of the state. Those at the bottom of the socio-economic stratum are less likely to have water sources or pipe connections inside their residence and hence need the provision of public taps the most. Neo-liberal era water reforms aimed at commercialisation and privatisation of water for efficient service delivery offer another dimension to the story. Such attempts have resulted in increasing the burden on the poor. Studies have shown how attempts at including the poor in the user-pays water supply network in a bid to reduce ‘non-revenue water’ (which is basically “free” water provided through public taps) have not resulted in reliable or sustainable services. The National Commission on Urbanisation (1988) has recommended that a per capita water supply of 70 litres per day is needed for domestic requirements. At least 90 to 100 litres per capita per day is required to lead a hygienic existence that must be ensured to all citizens. However, the per capita availability of water for a vast majority of low income people in Bangalore is only about 40-45 lpcd. In such a scenario, people turn towards options provided by the private sector. With the failure of the state failing to meet in supplying the basic need of water, private markets have promptly stepped in to fill the void. This has resulted in increased household expenditure on water. A study by Ranganathan has shown that when people buy water from private tankers, they spend close to five times the amount that BWSSB-supplied water would cost them. Our own interaction with several such households suggests that approximately 5% of their gross income is spent on tanker water and water cans. Shantabai lives on Central Jail Road and works at a local school as a helper. She claims to spend Rs 300 per month from her income on buying drinking water cans alone. Since the area has no public water supply, every few weeks she has purchase tanker water as well. The houses we visited commonly relied on private tankers to fulfill their water requirements even in areas with public water supply. However, the residents we spoke to expressed doubts as to whether they always get the amount of water they pay for. Residents suspect that the drivers sometimes pilfer water by selling small amounts to local businesses but have no way of measuring the pilferages on the way. However, in the absence of viable alternatives, people continue to rely on private tanker supply despite their suspicions. Packaged drinking water was a common sight in most of the low-income households we visited. The residents we spoke said they purchase three to seven cans per week for their consumption. These cans have a capacity of 25 litres. The price of each can varies between Rs 25 to Rs 35 depending on the locality, quantum of purchase, and supplier. Saraswathamma, who lives in a one-roomed house in Choodasandra, told us that she needs one can per day for her family of five. The private sector has thus managed to reach areas hitherto unserved or underserved by public water supply even though at a high price. And it does so in innovative ways to widen its customer base. For instance, tanker operators often use tractors to transport the water tanker in order to navigate uneven roads. They also sell water per pot to those who cannot afford to have storage systems like overhead tanks. Private networks operate in less visible forms as well. For example, eateries and food vendors who procure these 25-litre water cans in bulk often resell water in it to the local residents with a small profit margin. Geeta, who runs a small eating joint at Central Jail Road, relies on 25-litre water cans for drinking and cooking purpose. She also resells some of the bottles to the local residents, thus making water cans available in an area where formal suppliers haven’t emerged. Since she sells them from the location of her eatery, there is no cost of delivery and the cans are available at a slightly more affordable price. Geeta, like many residents in the city, believes that water supplied by the tanker can’t be used for consumption. “If you have good health you can work. What is life without good health?” she says. The women who purchase water from her agree. This busts quite a few myths about awareness levels among the poor regarding the link between water quality and health. We noticed a dependency on neighbours who have the means to install a bore-well. The owners sell water at Rs 2 per pot, limiting the number of pots per person – another form of a discreet informal water market. This arrangement is not entirely harmonious, as it often gives rise to friction between neighbours – especially with the cap on the number of pots per person. But it is an important source where households don’t have individual storage and public supply isn’t reliable. The presence of such a vast and varied private water supply networks have ensure a fragile peace for now. 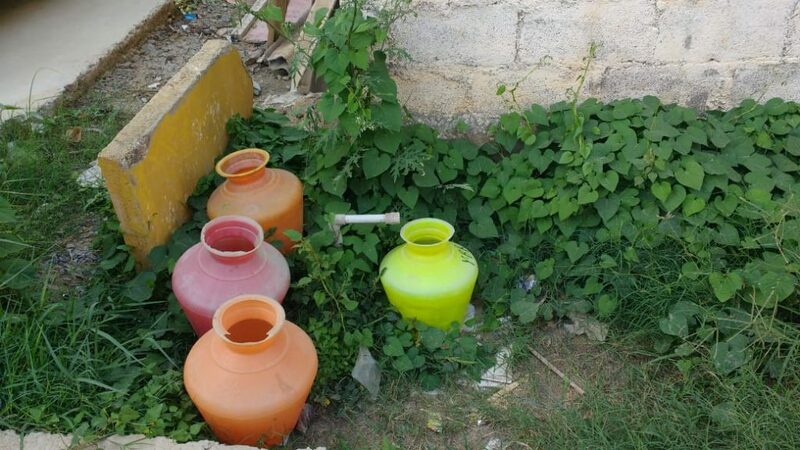 While access to or a more regular supply of BWSSB water is desired in general, the residents we spoke to report that they don’t feel the pinch of water scarcity as of yet because of the different avenues of water supply. Bangalore is a semi-arid city located at an elevation at a distance of about 100 km away from the nearest big river – the Cauvery. Francis Buchanan, in his journey from Madras through Mysore, Canara and Malabar, mentions the farming conditions and lack of water. This was in the year 1800. As such, water has always been scarce and it was managed by the state or communities through a network of wells, tanks and lakes as per records from pre-colonial times. Such cooperation can be seen in some form or the other when it comes to managing a scarce resource such as water. In several neighbourhoods in Bangalore, we observed that people have adapted to the scarcity and instituted a few norms which the local residents adhere to. For instance, several neighbourhoods follow a system of rotation by which local residents take turns to pay for the tanker water. Limiting the number of pots drawn and honouring the placement of pots when water is to be drawn on a first -come -first serve basis is another system which is quite common in localities depending on the public water source as well. Sushilamma, who lives in Choodasandra, informs us that there is a cap of five pots per person. Her locality has a public tap which supplies water once every two days and is quite reliable. Yet rules are in place to ensure that water is accessed by everyone in the locality. There have been instances where residents of a locality have rallied together to communicate with the public water utility employees with regard to the irregular public water supply in the area. In certain cases, collective action has worked, with BWSSB responding by sending tanker water to the area. It is worth noting that the public water supply entity is approached as a last resort. Perhaps this is one of the main reasons as to why there hasn’t been a Cochabamba-like “water war” or riot as of yet. The public sector may be unreliable in meeting water needs but turning away from it is no help either. People need an accountable authority to approach in times of need, or in the above case under extreme duress. A major role in muting the ‘crisis’ has been played by a combination of residents’ resourcefulness and the presence of vast private networks, albeit at a high cost. If we look at the four dimensions of water supply, namely availability, accessibility, quality and stability, there are observations to be made. Each of these dimensions has many facets, maintained in a delicate balance by several formal and informal approaches. From the end-user point, the many-layered and diverse private market has filled the availability gap. As for accessibility, is a good proportion of income is being allocated to water alone. The price differential between the public and private provision of water at the end-user level is very high. Awareness of quality awareness has led to consumption of packaged even if it comes at a higher price. Only time will tell if this fragile arrangement holds or shatters to expose the extent of the crisis. Shruthi Suripeddi is a Masters student at Azim Premji University, Deepika M G and AmalenduJyotishi are Associate Professor and professor respectively at Amrita School of Business, Bangalore.